JOE SAVIAK has been hired as Executive Director of the Flagler County Sheriff. SAVIAK left Flagler College last month. SAVIAK threatened the Florida Board of Law Examiners and judges with criminal and civil actions when he flunked the Florida Bar. SAVIAK falsely attacked Bill Nelson as an. anti-Semite in 1998. SAVIAK made false and malicious attacks on Mayor Nancy Shaver, 2016-2018. SAVIAK made illegal threats agains me in 2016. SAVIAK claimed he would not be hired by many colleges and universities because he's a "Christian" and a "conservative." Flagler College wisely decided it no longer needed SAVIAK's services, such as they are. 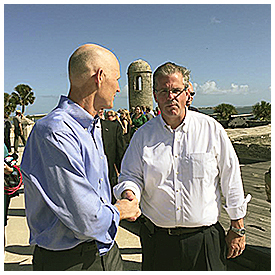 So Flagler County Sheriff Frederick "Rick" Staly hired him? interviewer evaluations of all applicants.